NEET Cutoff 2018 – The Central Board of Secondary Education (CBSE) has released the qualifying NEET 2018 cutoff marks for all the categories, along with the declaration of NEET result on June 4, 2018. 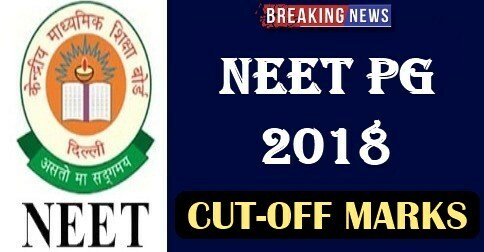 The cutoff of NEET 2018 has seen a decrease across the categories compared to the previous year. As per NEET cutoff 2018, candidates belonging to UR category are required to score at least 119 marks (out of 720) in order to qualify NEET 2018, while OBC/SC/ST category candidates need a minimum of 96 marks to qualify. The NEET 2018 cutoff or qualifying marks for UR-PH category is 96. The highest marks scored in NEET 2018 is 691 out of 720. This year 7,14,562 students have qualified the exam this year as compared to 6,11,739 last year. Candidates can check their individual NEET 2018 result from the link given below. Only those candidates have scored the qualifying marks as per the NEET 2018 qualifying percentile are eligible for further NEET 2018 MBBS and BDS admission process. NEET 2018 has been was conducted on May 6, 2018. The official answer key of NEET 2018, the OMR answer sheets and test paper codes were released for candidates between May 25 and May 27, 2018. The NEET Cut off also indicates the marks which candidates need to obtain to ensure their admissions to medical and dental seats. Only those candidates who have scored equal to or more than the NEET Cut off 2018 percentile requirement are qualified and have been given All India Rank (AIR) by CBSE, the exam conducting body of NEET. On the basis of NEET scores and All India Rank (AIR) of all qualified candidates, central and state counselling authorities will release their respective merit lists and hold admissions to MBBS/BDS courses. Candidates must note that NEET Cutoff 2018 qualifying percentile is different for different categories. The Unreserved category candidates are required to obtain marks equal to or more than the 50th percentile in order to qualify NEET and as per the NEET 2018 cutoff, 6,34,897 candidates from UR category have qualified the exam. However, for candidates belonging to reserved categories, viz. Scheduled Caste (SC), Scheduled Tribe (ST) and Other Backward Classes (OBC), the minimum qualifying Cut off of NEET 2018 is 40th percentile. The corresponding Cut off score of NEET Cut off 2018 percentiles, which will be the minimum ‘marks’ required to qualify NEET 2018, will be declared along with the declaration of the NEET 2018 result. Candidates can check here complete details about NEET 2018 cut off, including minimum qualifying percentiles, previous year NEET Cut off trends and highlights, etc. As per the NEET 2017 statistics, out of 10,90,085 candidates who appeared, only 6,11,539 could qualify the exam by scoring marks equal to or more than the NEET Cut off qualifying percentile requirements. As per previous year data, unreserved candidates had to score atleast 131 marks in NEET 2017 in order to get equal to or above the 50th percentile and reserved category candidates had to score at least 107 marks in order to get equal to or above the 40th percentile as per the qualifying Cut off requirements of NEET. Candidates aspiring to qualify NEET 2018 are to score equivalent to or more than the percentile Cut off of NEET 2018 and the marks as mentioned in the table below. Marks scored by a candidate in NEET 2018 should be such that it is equal to or more than the qualifying Cut off of NEET 2018, else candidates will not be able to qualify the exam. NEET 2018 Cut off is issued by the CBSE in the form of percentile instead of specific marks. Percentile represents how a candidate performs comparatively to others who appear in the test. For instance, if a candidate’s marks are in the 45th percentile, it would represent that he/she has scored better than 45 per cent of all the candidates who appeared in the exam. Utilizing percentile mode of Cut off in NEET ensures that various factors like exam difficulty, preparation levels of test takers, etc. of respective years in which exam is conducted are taken into account while shortlisting qualified and unqualified candidates and fairness is maintained. Candidates must note that in the unlikely circumstance of there being insufficient number of candidates in respective categories who do not clear minimum qualifying percentile requirements of NEET 2018 Cut off compared to the number of available seats, the Union Government holds the right to revise and lower the minimum percentile requirements of NEET Cutoff 2018 for MBBS/BDS admissions in consultation with the MCI (Medical Council of India) and the DCI (Dental Council of India). Marks in Biology in NEET 2018: Candidate who has scored more marks in the Biology section of NEET 2018 will be placed higher in the merit order compared to the one who scores less. Marks in Chemistry in NEET 2018: In case the tie remains even after considering above-mentioned factors, then the candidates’ marks in Chemistry section of NEET 2018 will be considered. The one with higher marks in chemistry in NEET 2018 will be placed above those with lesser marks. Number of Wrong Answers: In case the tie still persists after considering the above-mentioned factors, then candidates with the least number of wrong answers or incorrect responses will be placed higher in the order of merit than the ones with more wrong attempts. Age: If the tie remains even after considering above preferences, then seniority will be considered. Candidates senior in age will be given higher merit order than the younger ones. The NEET score is given out of 720 marks. The category-wise number of candidates who qualified NEET 2017, along with the marks required to qualify in each category, are mentioned in the table below. Candidates can check below a category-wise comparison of Cut off scores (minimum qualifying marks) of NEET 2017 and NEET 2016 corresponding to the qualifying percentile requirements from each year. Candidates of respective categories, who scored marks exactly as per these percentiles or above, were declared qualified for admissions in NEET 2017 and NEET 2016. The minimum qualifying percentile required to qualify the medical entrance exam in both years was same as the NEET 2018 Cut off percentiles mentioned above. In other words, these Cut off scores have been arrived at by adopting percentile-based methodology. As per the data of NEET 2017 AIQ counselling, Unreserved candidates upto rank of 8,317 were selected for MBBS admissions under AIQ Quota, while for BDS admissions, candidates upto the rank of 12,419 were considered. NEET 2018 aspirants can check below the graphical representation of AIQ last ranks under various categories to get admission to MBBS and BDS seats in NEET 2017, NEET 2016 and AIPMT 2015. The result of NEET 2018 has been declared on June 4, 2018 by 2.00 pm. The NEET result 2018 has been declared by CBSE, the conducting body of NEET. The NEET 2018 result has been declared in an online mode in the form of a scorecard. The NEET result contains marks of the candidate and their All India Rank (AIR) as well as overall AIQ and category-wise ranks for successful candidates ie. those candidates who qualify the NEET exam by scoring minimum required Cut off of NEET 2018. The merit lists of NEET 2018 for admission under state quota will be prepared by the respective state counselling authorities. However, NEET merit list 2018 for admission under AIQ will be prepared by CBSE and MCC will take admission for AIQ seats on the basis of the same. AIQ NEET 2018 merit list will be prepared in two formats – an overall merit list and category-wise merit list. NEET 2018 counselling will begin from July 12, 2018, in online mode. At first, the counselling for All India Quota (AIQ) 15% seats will be conducted by the MCC in two rounds and then the counselling of NEET 2018 for 85% state quota seats will begin. NEET counselling 2018 for state quota admissions will be conducted by respective state counselling authorities. Candidates will need to register themselves online for participating in counselling of respective counselling authorities for MBBS and BDS admissions. The total number of seats available for allotment in different rounds of NEET counselling 2018 will be released by respective counselling authorities before the beginning of counselling session. Schedule of the counselling of NEET 2018 will be released by MCC and respective state counselling authorities and it will be made available here as soon as it is released. The MCC will declare the number of seats available for allotment before every counselling round of AIQ admission. The result of seat allotment of NEET 2018 containing candidates’ AIR ranks, category and the name of the medical/dental college in which the admission is allotted, will be made available after every round of counselling. The same pattern will be followed in NEET 2018 seat allotment under state quota admissions. Through the college predictor tool of NEET 2018, candidates can know the medical or dental college they are likely to get admission in on the basis of their All India Rank and NEET score. Using NEET 2018 college predictor will help candidates in filling appropriate choices of colleges at the time of registering for NEET counselling. College predictor of NEET 2018 will aid candidates in making a realistic assessment of the college they may be allotted at the time of seat allotment process. Candidates can use the NEET college predictor 2018 by logging in through their Google or Facebook accounts. They will need to submit their AIR rank, programme preference and some more details to get the list of colleges they are eligible for and are likely to get on the basis of their ranks and scores.